A little known independent Order; or possibly a lost Scottish Ritual found? Introduction: Despite being born, bred and initiated, many years ago in Newcastle upon Tyne, the author only became aware of the Knights Grand Cross of Jerusalem (KGCJ) in 1993 when the Knights Templar Priests (KTP) Year Book of that year made reference to them – see Appendix A. With this Order being based in Newcastle upon Tyne he was naturally most interested to find out more. Subsequent enquiries quickly made it very clear that this was a most secretive independent sovereign body and it proved virtually impossible to establish any information about them whatsoever. This naturally increased his desire to find out more! Fortunately he made the acquaintance of three brethren who were able to assist him. One was a member of the Knights Grand Cross of Jerusalem and initially he proved most helpful. The author sincerely hopes that the publication of this paper will encourage the members of this distinguished order to produce their own official and detailed history of the Knights Grand Cross of Jerusalem. The Early Grand Encampment of Ireland issued Warrant No. 34,9 dated 20 February 1807, probably authorised in 1806, to Joppa Encampment at Sunderland, which was no doubt received when the Encampment degrees were conferred in Edinburgh on the members of Newcastle and Sunderland Atholl Lodges. Subsequently after receiving an edict from the English Grand Conclave in January 1811 an English Warrant No.37 for Joppa Encampment,10 meeting at the Sign of Admiral’s Head, Sunderland, was granted on 21 February 1811 resulting from a petition dated 11 February 1811. This indicated the petitioners had been installed Knights Templar under sanction of St. Stephen’s Lodge, Scotland. Stephen Forster records ‘Members of the Joppa Encampment, resident in Newcastle, were also among the petitioners for the Warrant of the Royal Kent Encampment, which from 1812, was to become the stronghold of high degree Freemasonry in North East England.’ 11 Stephen Forster in The Mitre & The Pillar (1997) ‘p.19’ confirms the Joppa Encampment became dormant circa 1845 with Royal Kent absorbing degrees not already under Royal Kent control. Was Royal Kent Encampment also founded around this time? Alas there is no record of any Irish or Scottish Warrant being issued. William Waples stated ‘the Newcastle upon Tyne Brethren of the “Joppa” petitioned the “Joppa” for the support of a Warrant.’ 12 This English Warrant for Royal Kent Encampment No. 44, now No. 20, was sanctioned on 16 April 1812 and minute books have been in continuous existence since its first meeting on 9 October 1812 under that Warrant.13 Founders were recorded in the petition as Robert Thompson, Richard Fennings, Joseph Harrison, John Anderson, and Mark Thompson.14 The first named described as of the Cross of Christ Encampment, London, the other four being recorded as qualified under ‘Sanction of the Knight of Malta Lodge’ in the Second Royal Lancashire Militia. The Newcastle Atholl Lodge No.131 was founded in 1805 mainly by civilian masons initiated in the Knight of Malta Lodge.15 The Knight of Malta Lodge was warranted in 1803 by the Antients (subsequently erased in 1822).16 Interestingly the Atholl Lodge No.131 was later granted Warrant No.15.17 The Antient Grand Lodge minutes of 15 April 1813 state ‘Whereas our well-beloved brothers the Master, Wardens, and brethren of the Atholl Lodge, 131, in the town and county of Newcastle upon Tyne, having, since their establishment in 1805, conducted themselves according to the true principles of Masonry, and have been the means of extending the ancient craft in the North; as a reward for their zeal and industry, and a mark of our respect, We advance the sd Lodge to be No.15 in the Ancient Registry of England.’ 18 This gave the Newcastle Atholl Lodge precedence over all Lodges outside of London. The Knight Templar Priest Appendant degrees normally conferred by name are listed at Appendix C. Some KTP Tabernacles do however exemplify these Appendant degrees from time to time as approved by the KTP Grand College. It should perhaps be stressed that although one of the KTP Appendant degrees is the ‘Grand Cross of St. John’ it is admitted that no Tabernacle of the Holy Royal Arch Knight Templar Priests can confer the Grand Cross of the Holy Temple of Jerusalem.31 This can only be done by the Knights Grand Cross themselves in Newcastle upon Tyne. When the English Great Priory introduced the honour of Knights Grand Cross in 1872/3 it is recorded that the Knights Grand Cross of Jerusalem had been in existence for over 50 years.39 This would suggest a foundation developing from the Royal Kent Encampment circa 1821, less than ten years after the Encampment’s Warrant of 1812. The Minutes of the Knight Grand Cross Council are however only in existence from 1845.40 Indeed this was the basis for the Knights Grand Cross celebrating their 150th anniversary in 1995. There is however little doubt that the Knights Grand Cross of the Holy Temple of Jerusalem is one of those old established independent bodies holding inherent rights which they maintain and uphold as ancient landmarks. They are undoubtedly much more than of local importance. 3) Across the Scots Border. The wording of the ritual suggests a north of England or Scottish source, originating around the middle of the 1800s. However as Alexander Dalziel died on 30 June 1832 this seems more likely to have been between 1823-32 most probably 1830. It should be noted that Frederick Smyth in ‘Brethren in Chivalry’ (1991) ‘p.47’ refers to a manuscript book of 1830 containing the rituals in use at that time belonging originally to Alexander Dalziel of the Royal Kent Encampment at Newcastle. It is not known how far this ritual varies from the first ritual provided by Alexander Dalziel. Or indeed if the ritual originally worked by Robert Thompson in 1812 varied from that of 1859. Whilst there are those who feel inclined to trace the origin of the degree from Scotland there are others not of that opinion being guided by many small points in the belief that the Atholl or Ancient Templar system or some of the so called irregular bodies must be looked to. The author somehow doubts if the true origin of the Knights Grand Cross ritual will ever be proved beyond all doubt. The UGLE Library at Great Queen Street holds an A5 bound book titled ‘Old Royal Kent Degrees – Newcastle upon Tyne’ reference BE558/1 ROY. Within its many pages are manuscript notes on the Knight Templar Priest Appendant degrees. This is the only authentic record of the KTP Appendant degree rituals. At the end is a reference to the Grand Cross of the Holy Temple of Jerusalem but not detailed notes. Some masonic cypher follows. This book referring to the Knights Grand Cross states: ‘By treaty with Great Priory of England recognised as an independent Grand Body meeting at Newcastle.’ but unfortunately no date is shown for this treaty. Qualifications for Membership and Officer Structure, etc: Up to 1845 membership was much restricted for at that time it was broadened by making all Past and Present Commanders of the Royal Kent Encampment eligible ‘provided they meet the approval of the Grand Council’. 46 This continued up to 1888 when a new regulation was made admitting Past Preceptors of any Preceptory in Northumberland and Durham provided they were subscribing members of ‘Royal Kent’ and passed the ballot.47 It should be noted that today no ballot can take place unless five members are present and to prevent any favour or offence the candidate is elected by secret ballot after being approved by the Most Illustrious Grand Superintendent.48 The ballot must be unanimous, that is one black ball rejects and no further enquiry is made.49 The basic qualification for membership is to be a Knight Templar of at least six years standing and a subscribing member and Installed Preceptor of a Knight Templar Preceptory in the Provinces of Northumberland or Durham.50 Membership is however still strictly by invitation and subject to the Grand Superintendent’s prior approval. In recent years membership of the Council has averaged some twenty to twenty-five although in 1869 it was down to a mere twelve members.51 In modern times it can take on average some three or four years to reach the Chair of Grand Master of the Order.52 It is frequently quoted to anyone who asks about the Knights Grand Cross ‘that anyone who enquires about the Order is automatically barred from membership’! 53 It is usual for the Heads of the various masonic Orders in Northumberland and Durham, subject to them being qualified as a Knight Templar Preceptor, to be invited to join the Order although there have been at least three relatively recent notable exceptions who were ‘deemed to be incompatible’. 54 Clearly a non-specific term pre-agreed by the Knight Grand Cross hierarchy covering a multitude of perceived sins. One of the accepted raison d’etres for the Knights Grand Cross is for all the Heads of the various masonic Orders (the movers and shakers) to be able to get together to discuss and debate policy without interruption. The Order is governed by The Most Illustrious Grand Superintendent elected ‘ad vitam’ that is for life.55 He also appoints a Deputy Grand Superintendent. A Most Illustrious Grand Master and two Assistants are appointed annually with the Grand Master appointing his successor.56 (Note: in the old 1859 ritual the two Assistants are called First and Second Assistants. Whilst in the 1885 ritual they are called Senior and Junior Assistants. Though the 1946 Statutes of the Order reverted back and refer to First and Second Assistants.) The First or Senior Assistant normally acts as Secretary.57 The 1946 Statutes also have a Treasurer elected immediately before the Grand Master is inducted. The meetings of the Grand Council are open to every member and are normally held in November of each year, or such other time as the Most Illustrious Grand Superintendent shall consider convenient.58 Prior to 1946 the annual meeting was usually held in October. Members of yesteryear are listed in Appendix D but present day members known to the author have not been shown. The Order has met at many locations in central Newcastle upon Tyne. In 1889 it was meeting at Freemasons Hall, Maple Street.59 At the Central Masonic Hall, Newcastle in 1894.60 At Freemasons Hall, 18 Grainger Street West in 1914.61 It obviously stopped meeting at Masonic premises shortly after this when it took up its present cloak of secrecy. In 1925 it met at the Station Hotel and in 1953 at the Royal Turks Head Hotel.62 It is the custom and practice each year for the incoming Most Illustrious Grand Master to defray the total cost of the Festive Board dinner menu.63 Invariably the members also sign a menu card as a souvenir for the newly admitted Knight. 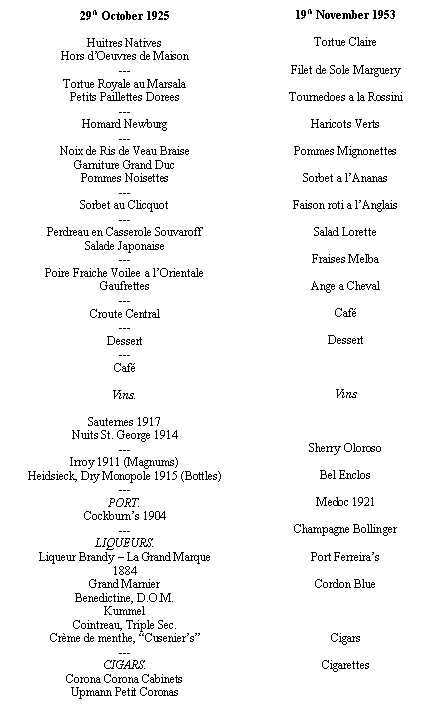 The menus for the 1925 and 1953 meetings shown in Appendix E make for a most interesting pre and post war comparison. Whilst the Knights Grand Cross may perhaps be perceived by some as a glorified dining club the author somehow doubts if its members would agree with that perception. (1) The Grand Cross, which each member is entitled to wear, suspended round the neck by a crimson ribbon 1 inch wide (illustrated in Appendix F). (2) The Grand Sash, also of crimson ribbon 4½ inches wide (to be worn from left to right) and the Ring which shall both be worn only by the Most Illustrious Grand Master and those who have filled that Office. (3) The Star Cross Jewel which shall be worn only by the Most Illustrious Grand Master for the time being. (4) The prescribed form of Star Cross Jewel for Past Most Illustrious Grand Masters. These last Jewels believed designed by Fred Schnitger are illustrated in Appendix G.
Alexander Dalziel was born at Wooler, Northumberland on the 22 May 178176 and was later apprenticed as a Gardener at Chillingham Castle owned by the Tankerville family.77 He subsequently became the Head Gardener and a recognised expert on the subject. He was initiated into Freemasonry on 31 October 1803 in his twenty-second year in the second All Saints Lodge (Atholl) No. 231 at Wooler.78 This Lodge was founded 13 December 1802.79 The first All Saints Lodge at Wooler (the premier Grand Lodge) was erased 28 April 1775.80 Alexander Dalziel was appointed Secretary of his Lodge on 30 March 1804 and occupied the Chair six times between 1806-20. 81 Clearly he was a most remarkable freemason. William Dalziel a Heraldic Artist and son of Alexander Dalziel was initiated in Newcastle upon Tyne Lodge.90 This Lodge was formed by a union in 1814 of St. Nicholas Lodge (premier Grand Lodge) and Atholl Lodge No.15 reflecting the previous years Union of the two Grand Lodges.91 In 1830 the minutes state ‘After a ballot for the Master Elect according to the instructions received from Grand Lodge, Bro. Mark Jobling was declared elected upon receiving 19 votes, Sir Charles Loraine receiving 18 votes. Out of this result, unpleasantness followed which caused the constitution of a new Lodge, under title of The Northern Counties Lodge No.586.’ 92 The initial vote by a show of hands had been an identical result and when referred to Grand Lodge it was declared in future all such elections should be by secret ballot as the minutes indicate. William Dalziel was a founder of this Northern Counties Lodge (later No.406).93 He did not occupy the Chair of this Lodge until 1855 twenty-five years after its Consecration demonstrating his desire to stay aloof from the split in the Newcastle upon Tyne Lodge.94 Nor was he ever Master of Newcastle upon Tyne Lodge. Though he was first Master for two years of St. Peter’s Lodge, later No.481, consecrated in 1842 and on three more occasions in the first eight years of that Lodge.95 There is no doubt he followed well in the footsteps of his father and was for many years another stalwart in northern Freemasonry. William Buckle Punshon was a Sunderland man who later resided in Killingworth, Northumberland.96 He was initiated in Newcastle upon Tyne Lodge in 1814 97 and although never a Past Master of this Lodge he became the ‘Grand Old Man’ of northern Freemasonry.98 Punshon was admitted a Knight Templar Priest in Royal Kent on 24 January 1864.99 He was the Knight Templar Provincial Sub Prior from 1867 to 1873 when he became Provincial Prior until 1878.100 The Reed and Schnitger Harodim correspondence in Appendix K101 mentions documents relating to this degree in the possession of Punshon. His protégé was Henry Hotham. Between them they spanned some 95 years and both played key roles in northern Freemasonry. Heraldic Arms of Early Members: The heraldic arms of the founders and early members of the Royal Kent Encampment were compiled by Alexander Dalziel as is evidenced by the letter from Robert Thompson in 1828 to the Royal Kent Encampment members.123 See Appendix L. Some thirty armorial bearings were originally hung in the Ancient Masons Hall, Bell’s Court, Newgate Street, Newcastle upon Tyne where the Encampment met and now hang above the stairs outside the Temples in Neville Hall, Westgate Road, Newcastle upon Tyne, the present meeting place of the Royal Kent Preceptory No. 20.124 The large arms are those of Robert Thompson (first Commander), Sir Charles Loraine, The Earl of Durham, and Alexander Dalziel. The smaller ones include those of Richard Fennings (founder of Royal Kent Encampment), William Dalziel, William Foulsham (of Foulsham Library fame) and William Buckle Punshon.125 When these heraldic arms were previously affixed at Grainger Street one of the mural arms on the wall had its name and device erased. Traditionally this is believed to be carried out whenever a Knight violates a trust.126 It should be noted that an 1843 edition of the Scottish Knight Templar Statutes included illustrations of the ‘armorial bearing’ of their Knights Grand Cross. Charles F. Matier, Vice Chancellor, and V. Em. Knight Major General J. C. Hay, Past Vice-Chancellor were admitted ‘Honoris Causa’.135 All had been honorary members of the Royal Kent Preceptory for some years. The 1946 Statutes state that ‘honorary members shall not be entitled to be present at any ceremony of the Order, and shall have no right to vote, but may attend the other functions of the Council’. Peter Glyn Williams writing about Lord Euston states: ‘During a visit to Newcastle upon Tyne in 1902 he was admitted to the Order of the Holy Royal Arch Knight Templar Priest in the Royal Kent Tabernacle and subsequently made an honorary Grand Cross of the Order of the Holy Temple of Jerusalem (an Order limited to Installed Preceptors of certain specific Preceptories), but being of Honorary status he was [sic] unable to be … .’ And also ‘Matier was in attendance on Lord Euston during the visit to Newcastle upon Tyne in 1902 and, with him, was admitted to this Order and created an Honorary Grand Cross of the Order of the Holy Temple of Jerusalem.’ 136 The Northumberland and Durham Year Books however list Lord Euston, Hay and Matier as KGCJ members from 1895 onwards thus indicating they made more than one visit to Newcastle upon Tyne and presumably received their honour in October 1894? The Secrecy of the Order: Why the Order maintains such secrecy is not known and is not understood. It was certainly not always the case. When Year Books for the Craft Provinces of Northumberland and Durham were first published in the late 1860s both Year Books included a full list of members and the office holders were clearly shown for all to see. This continued right up until 1915/16 when suddenly this practice ceased. What caused this change? A Knights Grand Cross member suggested in 1997 that it might have been because of the Great War? Negotiations with Charles F. Matier over the transfer of degrees to the Allied Masonic Degrees in the 1897 may have also been a factor? Particularly if the alleged threats and blackmail quoted by Prestige were still fresh in the memory.140 An extract from Harold Prestige’s ‘A Century of the Allied Masonic Degrees’ (1st ed. 1979) in Appendix M illustrates the difficulty of these negotiations. It will also be apt to quote from Trevor Stewart’s ‘Some Thoughts about the Social Pyschology of the “Extra-Craft” Degrees’ in AQC107 (1994) ‘p. 179’: ‘The strongly emphasised exclusion of outsiders by these Orders generates a correspondingly strong feeling of possession of the esoteric knowledge, the possession of which does not entirely gain its significance from mere ownership but also from members’ awareness that non-initiates must do without it. Conversely, of course, what is denied to the many ‘outsiders’ is perceived by initiates to have special value … Possession of esoteric knowledge by initiates of these Orders provides for them a position of exception and thereby operates as a socially determined attraction. Furthermore, as a corollary, it is a commonplace perception that all superior persons have something mysterious, an authority which flows from their enigmatic power. So everything arcane is assumed to be superior, important, essential and therefore, desirable. 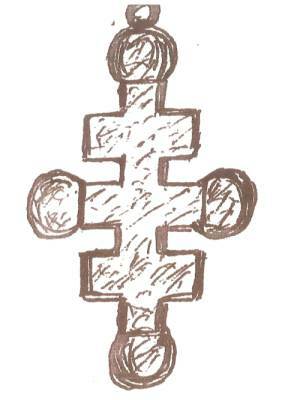 The Grand Cross of the Great Priory of Ireland: In 1805 the Early Grand Encampment of Ireland claimed to have been in existence for over a century, that is before 1705.141 This date is clearly doubtful with even Sir Charles Cameron, CB, Deputy Grand Master stating in his ‘On the Origin and Progress of Chivalric Freemasonry in the British Isles.’ AQC 13 (1900) ‘p160’ that such ‘antiquity seems highly improbable’. Freddie Smyth however certainly accepts that it was the first genuine and comprehensive masonic Templar authority in Ireland.142 It became very active and issued many Warrants including some for Encampments in Scotland and England. In 1837 the Supreme Grand Encampment, forerunner of the Great Priory of Ireland, replaced the Early Grand Encampment.143 The Prince of Wales on being elected Grand Master in 1873 introduced the honour of Knight Grand Cross.144 The author has found no evidence of a degree ceremony being worked in connection with this honour. The author can find no trace of a Royal Kent Encampment member having received the honour of Knight Grand Cross in Scotland. Is it possible the Newcastle KGCJ ritual working came through their contacts with the Edinburgh Encampment No.31? This begs the question do the Knights Grand Cross of Jerusalem in Newcastle upon Tyne work the long lost ritual of the Scottish Knights Grand Cross? This is most unlikely with the Grand Cross degree being worked in the Royal Kent Encampment as early as 1812.157 Stephen Forster who has spent considerable time researching Knight Templar and associated ceremonies in Scotland does not believe the evidence available would support the thesis that the KGCJ ritual originated north of the border. Certainly it could not have seen its genesis in the ritual of the Grand Cross of the Scottish Royal Grand Conclave since the first record of that ceremony appears some years after the founding of the Royal Kent Encampment.158 Perhaps the Scottish Knights Templar obtained their Knights Grand Cross degree when they instituted their honour through their contacts with the Newcastle Royal Kent Encampment? (8) The Royal Kent Knights Grand Cross of the Holy Temple of Jerusalem. Detailed information on membership of the Knights Grand Cross of Jerusalem was included in both Northumberland and Durham Year Books from their first edition up until 1915/16. The Great Priory of England Minutes of 13 December 1872 has been previously quoted. There are also a number of references to the Knights Grand Cross of Jerusalem in John Strachan’s ‘Northumberland Masonry’ (1898). Likewise some extracts of Harold Prestige’s comments on this Order in his ‘A Century of the Allied Masonic Degrees’ (1st ed. 1979) are shown in Appendix M.
And of course in 1993 the Knight Templar Priests Year Book mentioned this Order. See Appendix A. This was the initial spark that prompted the author’s research into this little known independent sovereign Order. There are also brief references in Peter Glyn Williams The Preceptory of St. George No.6; Bicentenary History (1995). The author would be very interested to learn of any other references in the public domain. Conclusion: To say that the researching of the independent sovereign Order of the Knights Grand Cross of Jerusalem has proved difficult because of the secrecy of the Order would be an understatement! Accordingly the compiling of this paper has certainly proved a most interesting challenge for the author. Whilst attempting to focus on the Order of the Knights Grand Cross of the Holy Temple of Jerusalem the author has occasionally been tempted off course by interesting snippets of information which he trusts have not detracted too much from the prime purpose of this paper. Namely by lifting the veil of secrecy in this small way that the members of the Knights Grand Cross of Jerusalem will themselves be stimulated to come out and produce their own authentic history of this unique Order. In addition the author truly trusts the results of his researches described herein will be of interest to many. The Knights Grand Cross of the Holy Temple of Jerusalem in Newcastle upon Tyne is self-evidently an ancient Order the members should be extremely proud of. Finally it would be remiss of the author if he did not acknowledge the valued help he has received from many brethren in compiling this paper. Whilst the nature of the paper suggests it would be inappropriate to name them they undoubtedly know who they are. The following degrees were given by St. Bede’s Lodge according to an endorsement in No.48 Book of Foulsham’s Library, which formerly belonged to this Lodge. This was a series of degrees of the Council of Emperors, but how it became to be established in the Lodge is not known. The Knights Templar Priests Appendant Degrees (normally conferred by name). I had your much esteemed favour of 16th Sept. respecting those brethren who have hitherto resisted the commands of the Grand Lodge in not paying quarterage, a list of whose names shall be subjoined to that of the contributing members when forwarded with their quarterage and I can assure, Sir I have exerted the utmost of my power on this as well as all other occasions since I joined the society, to promote the interest of this Lodge and the craft in general, by acting in strict conformity to the excellent rules and regulations contained in our books of Constitutions & Byelaws, and other enactments for the Government of the Craft, but I felt great difficulty in Reconciling many of the brethren of our Lodge who have even paid quarterage, on account of the insinuations of others who were impressed with an idea that the Grand Lodge would not extend their Charity to brethren of Country Lodges even in the most pressing emergency. Now if Grand Lodge will grant any relief to the brother whose case is stated in the enclosed sheet it will immediately remove those doubts which are entertained by many of the brethren of our own and other neighbouring (Lodges) and be the means of bringing many forward to pay quarterage who are at present quite averse to it. We would gladly know if there is yet an edition (printed) of the Constitution &c. and whether any other measures have been adopted to convey instructions to county Lodges than that of sending deputies to the Lodge of Reconciliation, as it is quite out of the power of this and many other county Lodges to send deputies – and after much money expended on my own part and long perseverance in searching after Masonry for the information of this Society, as a matter of great regret I must say I am extremely mortified and disappointed to find, that excepting Brothers Morton & Ramsey of St. Cuthbert, Tweedmouth with whom I have often laboured, I can find little better in general practice in the North of England than what is contained in that called J. & B. and the practice of which can never tend to effect the grand intention of – and so corrupted is the science in many parts, that a brother of ours who now resides in Glasgow, and has visited many Lodges in the North, informed me, that immediately after their initiation in those parts they were advised to purchase J. & B. for their instructions. I have seen some of Finche’s publications in the hands of strange brethren and altho’ they certainly excite great curiosity in Masons who are anxious for information and can derive it from no other source, we have determined to adhere strictly to the injunctions of the Grand Lodge not to purchase any of them. N.B. Is Royal Arch Certificate granted on the same terms as usual. WHEREAS it has seemed proper and right to me to continue this independent Order as above proposed under the aforesaid authority. “ “ “ Ferdinand Fritz Schnitger, Marshal as P. Gd. High Priest. “ “ “ Robert George Salmon, as a member of the Order. “ “ “ Thomas Pickering, as a member of the Order. the Royal Kent Encampment or Preceptory. in whom the first government of the Order rests together with the undersigned and who are to elect from amongst themselves their High Priest for the year 1894. GIVEN at my temporary residence, Hopetown Place, Moffat, Good Friday, March 23rd, 1894. Of the Holy Temple of Jerusalem. On close investigation and after consulting with one or two authorities on such matters I find it clearly established that the Knight Templar Priest Order is and always was attached and under the government of the Grand Cross. In fact the Point of the Grand Cross as worked in R. Kent is the cumulative or Grand Point of the Knight Templar Priest Order. It appears that Templars who were not P.E.P’s received the first part and the last part – the Grand Cross was usually conferred upon P.E.P’s only or E.P’s, at least I have reconstructed the whole KTP degree – except the Grand Cross which I do not touch completely. All the secret and working are restored & the degree is in working order. Sir Kt. Hotham as you are aware has granted and signed the Charter for working the KTP & we are – de facto – KTP’s. All my or rather our friends are however with me that insomuch as this KTP forms part of the Grand Cross & is a degree subject to it of old right, that a distinct refusal of the Gr. Cross authorities to continue this old allegiance is necessary to us before we can separate this body from the Gd. Cross. It is not for me to suggest what the Brethren of the Grand Cross shall do or decide, that is of course in their entire discretion. What my duty amounts to is to point out this allegiance of the KTP due to its head, the Grand Cross, and to assure the G. Cross that only by their deliberate action a severance can take place. On the other hand if the Gd. Cross express their intention to maintain their ancient Right & claim allegiance due to them I am certain the few existing KTP’s will hail this decision with great satisfaction and willingly continue the allegiance to that body. It would then become necessary in the latter case to have a new authority drawn up so that Sir Kt. Hotham might sign it, and also the remaining Gd Officers of the Gd. Cross. I can put that right in 24 hours. The certificate so far as printed part of it is concerned would also have to be modified slightly – another trifling matter. You will readily perceive that my hands are tied pending the decision of the Gd. Cross, and I shall be glad if you will be good enough to signify the decision of the Knights Gd. Cross as early as possible. It is also clear that every Knight Gd. Cross is by virtue of holding the highest point of KTP (the Gd. Cross) a member of the inferior point (the Royal Arch Knight Templar Priest) and no initiation or joining could take place so far as the Gd. Crosses are concerned. If the Gd. Crosses decide to sever the connection that would of course make a material difference. Awaiting favour of your reply. 1892. Baltic Chambers – Newcastle upon Tyne. To Bro. R.B. Reed Esq. I have long and seriously thought about the Harodim and come to this conclusion. We have our descent without a beginning but clearly from 48 as that is the first mentioned working in the world. You had the degree conferred in direct descent from 48, it is a pity to break the old line of descent, and we are human, all of us. The question arises, will you transfer and assign, or in any way hand to us, through me, that line of descent so that it may be regularly transmitted hereafter. I may say, that the development of degrees has made it impossible to work the Order as of old, that was only possible when a Craft Lodge taught all knowledge to 1814 and gave all the degrees. Now I could not as Chief Harod give the Mark knowledge and Lectures to a Harodim who has not the Mark and this applies with equal force to all other degrees. Hence the impossibility of working all the Sections. This is the reason of the decay of the Harodim and the final death stroke was given in 1814 when the Craft declared the other degrees out of its pale, and the former Christian Lectures were made into monotheistic ones – for good or evil does not concern us here. What you have received was the source of the Harodim over the Craft only. Those who gave it to you, held it probably over all, having received it probably in pre-Union times, when all knowledge was centred in the Craft. I enclose a form of cessio (or transmission) for approval or alteration. Thence follows the suggested form of transmission. I, R---- B----- Reed, a Pastmaster of Lodge 48, Gateshead, under the English Constitution, having been admitted by my predecessors to the honour of being ‘made free of Harodim’ in order that this power may not cease, hereby transfer the same to Bro. F. Schnitger, who has already received the power of conferring this Order to the best of my belief and according to his statement, which I have every reason to believe correct, through transmission by the Templar Body and its predecessors, to which he belongs, and of which body many former members belonged to Lodge 48 (Lodge of Industry). I am convinced that by so doing the old institutions will be faithfully continued under the present altered circumstances, and with that intent I authorise him to continue it, according to the best of his ability in regular form to his successors. I am induced to do so, the more readily as Lodge No.48 is not now permitted to work the Order. Letter from Bro. Reed, dated 11th January, 1896, to Bro. Schnitger. I acknowledge by Post card receipt of your favour of the 20th ult. and now thank you for the particulars you gave me concerning the documents relative to the Herodiam degree which have come down to you from the posterity of our late Bro. Dalziel. You are fortunate in being the custodian of these documents and we much look to you to restore the working of this degree on Tyneside. You are aware of course, that the Herodiam Degree was worked in the olden days in connection with the Industry Lodge, but so far as I can gather there are no records of this working in the hands of any of the Brethren of the Industry Lodge. I had hoped that I might have had in my Masonic papers some trace of the Harodiam degree but my search has not been successful. I suspect therefore, that you are in the happy position of learning more respecting this Degree than any of the Northern brethren and we shall have to look to you to communicate this knowledge to those you deem fit to receive it. For myself I cannot in any way add to your store of knowledge on this subject, indeed my mind respecting it is as clear as a sheet of paper. I must congratulate you and your colleagues on the good work, etc. etc. We must have some conversation respecting the Herodian Degree. There are points difficult to explain in a letter. I shall be glad if you will make an appointment with me for any day next week at this office. Enclosed you have my letter to you as agreed, respecting the Harodim Degree. It meets, I think, all your requirements. Please acknowledge receipt that I may learn the Document has safely reached you. Here follows the letter of assignment. I am glad to learn from you that the old Documents in connection with the old Harodim Degree formerly belonging to our late Bro. William Punshon of Killingworth and afterwards to Alex Dalziel of Newcastle and Cardiff have been given to you. These valuable Papers will, I trust, restore the working of the Harodim Degree in its integrity. To myself, personally, the matter is one of great interest, my Grand-father Joseph Reed, was a member of Industry Lodge No.48 at a period when that ancient Lodge was a working, as well as a Speculative Lodge, and his Indentures as a Working Mason were, some years ago, placed in the archives of the Lodge. In my Grandfather’s time the Harodim degree was worked in connection with Industry Lodge, and it is pleasant to know that its instruction will now by you be communicated to selected Brethren. If I have any authority to empower you to do this, so far as that authority may extend, I have pleasure in extending it to you. W.M. Industry Lodge No.48 – In the year 1870. I beg to apprise you that at the Conclave held on the 22nd of May, it was determined that as Sir Knights of this Encampment who may be willing, in exercise of his right to do so, to incur the expense of placing in this lodge room his heraldic bearings impaled with the arms of the Order, should be invited to do so and the Conclave have requested Sir Knight Dalziel to prepare specimens thereof. I have the pleasure to inform you that the same are now ready for inspection at his house in 21 Collingwood Street, and to request your early attendance to, and direction on, the subject. The Illustrious Order of Knights Grand Cross of the Holy Temple of Jerusalem controlled in the neighbourhood of Newcastle-upon-Tyne a number of post-Craft degrees under the Atholl (Ancient) Grand Lodge. These and others collected from various sources, totalling in all over forty, most of which were by 1893 extinct elsewhere, were worked in Royal Kent (Templar) Tabernacle at Newcastle, which dates back to at least 1809 and has evidence of working the Red Cross of Babylon (AMD) in connection with the Royal Arch and some Heredom degrees from 1822 and the Cryptic degrees of Royal, Select and Super-Excellent Masters from 1830. When members of the Cryptic degrees applied, rather belatedly, in 1893 for a Warrant to work as Royal Kent Council under the aegis of the new Grand Council of Royal and Select Masters in London, (Charles) Matier (the Grand Secretary) discovered that there were degrees being worked in Newcastle of which he knew nothing. He therefore opened negotiations with the Knights Grand Cross for the formation also of an Allied Royal Kent Council, possibly as a jumping-off point. 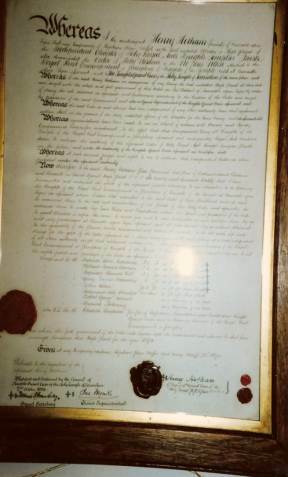 This Council was granted on 28 July 1893 a Warrant confirming the petitioners in the powers and privileges, which they already possessed (as a Conclave of Red Cross Knights) with Time Immemorial status, and giving them authority to confer those degrees, which were or might be under the jurisdiction of the Grand Council. W. F. Carmon, to whom the preservation of the old degrees was almost entirely due, was appointed Grand Junior Warden. States but not on this country. Some of the degrees may have been inherited from the Joppa Encampment at Sunderland (1807), which became dormant about 1845. Matier was at this period having trouble with the Council of Concord over the working the Knight Templar Priest. It was therefore natural that he would welcome the addition of that and all its associated degrees to the Allied Order. There is a conflict of evidence about the method by which this finally came about. One source believes that the Knights Grand Cross were anxious to ensure the preservation of these historic degrees by entrusting them to the larger and by now widespread Grand Council, and voluntarily offered to negotiate arrangements for their continuance accordingly. Other sources allege that Matier by threats prevailed on the unwilling Knights Grand Cross to hand them over; the word 'blackmail' is used in one record. Napier-Clavering (GM of AMD, 1920-1931) in a manuscript memorandum went so far as to write of 'threats of excommunication' but, as he was certainly not aware of the existence of the degrees at Newcastle before 1909 at the earliest, he could only have been repeating an ex parte statement. “Negotiations are now pending by which this Grand Council (AMD) will assume the authority over various side degrees, which up to the present have been conferred under Time Immemorial rights without Warrants. Many of the ceremonies are only of value to the Masonic student as affording considerable information respecting the connection of the present system of Freemasonry of the eighteenth century. The veil was lifted by printing in the Year Book for 1897 an Agreement made on 1 January 1897 between the Allied Grand Council and the Knights Grand Cross 'existing from Time Immemorial'. This recited that both parties considered that separate jurisdictions over 'degrees belonging to one sequence or forming sections thereof or otherwise' were not conducive to Masonic Unity nor to giving effect to the full teaching and use of the degrees. The Grand Cross body therefore agreed ‘in the interests of Masonic Unity’ to join the Allied in forming a Grand Council of Rites to administer a number of degrees within the jurisdiction of the said Allied Degrees and for that purpose transferred and ceded its rights to the Allied, ceasing to exercise the powers vested within its body of working, or any authority over, the degrees named in an attached schedule. The Newcastle Tabernacle [sic] now working the degrees was to be designated 'A' on the roll of Subject Councils of the Grand Council of Rites, and its members if or when qualified by receiving the existing Allied Degrees were to be recognized as holding Past Rank on the Grand Council of Rites. A special clause provided that nothing in the agreement would in any way interfere in the absolute Prerogative of the Grand Cross Body to continue the administration of the Degree and honour of a Knight Grand Cross of the Holy Temple of Jerusalem as an independent body. 99 ‘The Mitre & The Pillar’ Forster, S. (1997) ‘p.22’ Printed privately by the Author. 102 ‘The Mitre & The Pillar’ Forster, S. (1997) ‘p.30’ Printed privately by the Author. 105 ‘The Mitre & The Pillar’ Forster, S. (1997) ‘p.32’ Printed privately by the Author. Note A: The facts stated in ‘A Review & Update of John Strachan’s History of Northumberland Freemasonry’ an unpublished Paper by the late Dennis Dixon and former Librarian at the John Sherwood Stephenson Library and Museum at the Provincial Office of Northumberland are invariably based on documentation held by that Library. Unfortunately the Author has not had the time to verify this documentation used by the late Dennis Dixon. Note B: The Author has not had the opportunity to scrutinise all the Minutes of the Grand Council of the Knights Grand Cross of Jerusalem. However a copy of extracts from the Knights Grand Cross of Jerusalem Grand Council Minutes relating to key points is in the possession of the Author, which authenticate various statements made.